Expect excellent instruction and clinical training in your online nursing program. For many students, online nursing instruction represents a dream-come-true, because it enables them to complete professional training while they keep their jobs and care for their families. Contrary to popular belief, online nursing schools and degree programs are neither easier nor less expensive than comparable programs at traditional colleges. Online programs do, however, afford students greater flexibility in their course schedules, and studies show online students complete their degrees faster than their four-year college cohorts. Most importantly, experts agree online nursing programs have special value for RN-to-BSN students, many of whom receive financial aid or tuition reimbursement from their employers. The core curriculum is just about the same in every nursing program. 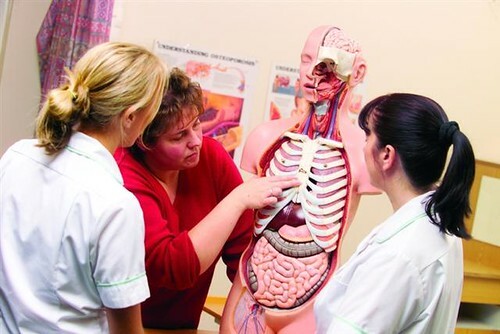 After you complete your introduction to the history, theories, best practices, and basic skills in nursing, you will study “pathophysiology”–the science of assessing and treating the effects of illness in a generally healthy body. Then you will study pharmacology, learning all about the benefits and risks of the most commonly prescribed drugs. Finally, you will complete your basic course in health assessment, which teaches you the essentials of preventive care. In all your courses, you will build your critical thinking and decision-making skills, and you will address difficult issues in medical ethics. Even if you complete your coursework online, you must complete in-person clinical training. In your clinical training, you first will learn the requirements of patient care by practicing on your classmates. When you have mastered the basics, you will work with patients under your instructor’s strict supervision. Coursework for your bachelors degree includes three science courses with labs–organic chemistry, anatomy and physiology. Lots and lots of work.The speed and intensity of online classes sometimes surprise students, because online nursing classes compress traditional sixteen-week courses into just five weeks. Consequently, you always have another discussion, activity, research paper, clinical observation, or test coming up, and you no longer have the luxury of falling a little behind and then staging a daring, dramatic, end-of-semester comeback. Online courses challenge your responsibility and initiative in ways traditional courses do not, and that time you used to call “free” now is devoted almost entirely to school. Strict enforcement of deadlines and standards.Online colleges and universities encourage instructors to exact harsh penalties for late work, because tough standards tend to keep you on-task and performing well. To assure their academic integrity, earn their accreditations and live down ugly stereotypes, online universities enforce strict standards for scholarship and research. Expect to learn as much about footnotes as you learn about podiatry. To help you satisfy the rigorous standards, however, your instructor inevitably will supply tons of supplemental resources, and the best online instructors are always available via chat or e-mail. To stay competitive, you and your classmates must take advantage of discussion boards and class-related “social” networks. Amazing diversity among your classmates.Your online classes will defy your expectations about gender, ethnicity, age, prior academic experience, language and math proficiency, and just about everything else you have come to expect in a traditional classroom. Your class probably will include as many men as women, and your classmates probably will range in age from seventeen to 70. Students will come from literally all over the world, and some of your classmates may still live and work in emerging nations. Some will be developing their skills and knowledge for promotion to more responsible jobs, and others will be at the very beginnings of their careers. 100 percent digital course materials.Expect to find your books in electronic libraries and do your reading from e-books and digital journals. Your electronic books will have built-in highlighters and wide margins for notes. Like all textbooks, e-books come with glossaries, great diagrams, and chapter reviews. Best of all, e-books contain literally up-to-the-minute information on diagnosis and treatment of every disease and injury known to humankind. Of course, you will submit all your work online, and your instructors will run your work through plagiarism checkers. Challenges to your technological skills.Before you take your first online nursing class, make sure both you and your computer are up to its demands: your computer must have sufficient power and memory to hold open sevral screens simultaneously, and your internet service provider must deliver enough band-width to accommodate all your materials. You must be proficient with Adobe readers and “flash” programs, and you must have respectable skill with Microsoft Excel and other advanced computation programs. Because all nurses must satisfy the same licensing requirements by passing essentially the same tests, nursing school curricula do not vary. Accreditation and pass-rates for the tests do, however, vary dramatically; often, starting salaries for alumni of different programs also vary dramatically. After you read the brochures and speak in person with admissions counselors, conduct an independent investigation so that you start your online nursing program with complete confidence that it will deliver exactly what you need and expect. Martha Ramsey is a freelance writer who investigates online nursing programs and degree options. If you are interested in becoming a nurse, Martha recommends that you complete an online program. What is TRT and its Benefits? The Tea Plant: How Do You Get Five Different Teas From It?